Our next blog pick and my last night's dinner was courtesy Bhags' Crazy Curry. I dig the simple, yet good looking food she creates. And I dig good lemon rice anywhere, so this was an easy recipe to bookmark. I had to make one adjustment to her original recipe because Bhags, like good Indian cooks anywhere, assumed that lemon rice needs onions. No, it doesn't, but she realized it only after she had posted the recipe. I dutifully excluded those, and the rest of the recipe was simplicity itself. Boil 1/2 cup long grain rice (basmati for me) until done. Spread in a plate and mix in juice of one lemon. Heat oil in a pan. Add a few curry leaves and 1/2 tsp each of mustard seeds and cumin seeds. Once they splutter, add a tbsp each of chana dal and urad dal, let them fry for a couple of minutes and throw in a tbsp of cashewnuts. Add a pinch of turmeric for color, now add the rice and mix to coat and color everything yellow. Add 1/4 tsp salt (or more if you like) and cook for another minute or so. Okay - here's a confession. I forgot the salt! Yes, and I only realized it once I'd clicked my pictures and sat down to eat dinner. So what I did was heat up a tbsp of water, added salt to it and then mixed in the rice. Let it cook for a minute and it was as good as new. Lemon Rice seems to be a tough recipe to mess up. A fav of mine..Give me this and potato stir fry..and I'm in heaven! As rachel said the combo is really heaven. 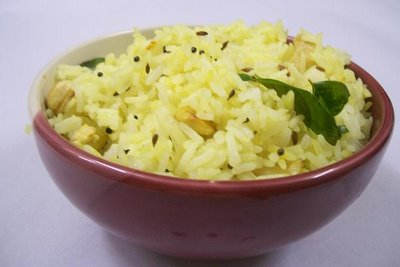 One of the easiest and tastiest variety rice. looks lovely, lemony, and perfect ! I agree with Rachel, potato stir fry is the best combo..
You are right! It was perfectly lemony. Bhags/Sangeeth : I love the bowl too. Its one of those Chinese sets that have bowls varying in size from a smal, tiny one to a huge soup bowl. Something like the Russian dolls. Mast! Looks as good as it can get!